Almost everything we do requires a custom solution. 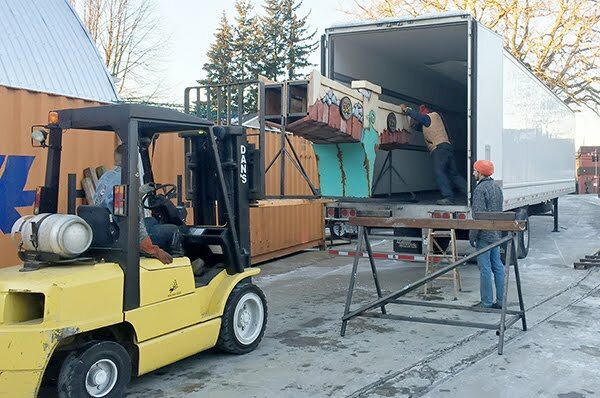 As we set to load the first shipment of arches for the NEBs Bowling Alley project we had to devise a way to get the long features into the trailers which were fifty inches off of the ground. Our solution was to build a sturdy welded steel sawhorse the height of the trailer. 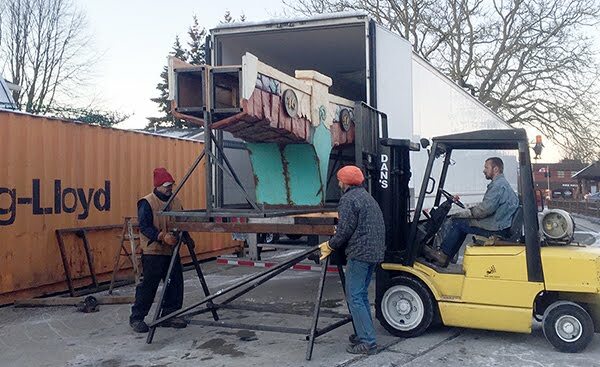 We then used the forklift to swing one end of the arches into the trailer. The boys put the sawhorse under the outer end and then the forklift was used to lift it off the sawhorse and stuff it into the trailer. It wasn't't long until we had ten arches loaded along with the many beams and posts for the project. The first load will leave for Oshawa, Ontario tomorrow. That makes a whole lot more room in the shop to continue building more pieces for the project.